Alex Henery is the only kicker in NFL history with a minimum of 20 attempts to make 90 percent of his field goal attempts. From Reuben Frank's "Eagles by the Numbers: The only positive stat"
Had enough negativity? Had enough misery? It’s been a tough stretch for the Eagles. Three-game losing streak. Juan Castillo’s firing. Questions about Michael Vick’s future. A head coach on the hot seat. Players openly questioning the team’s heart. So for this week’s "Eagles By the Numbers," we wanted to give everybody a break from all the gloom and put together some nice, positive, cheery stats. We wanted to, but we couldn’t find any. OK, well, we found one. 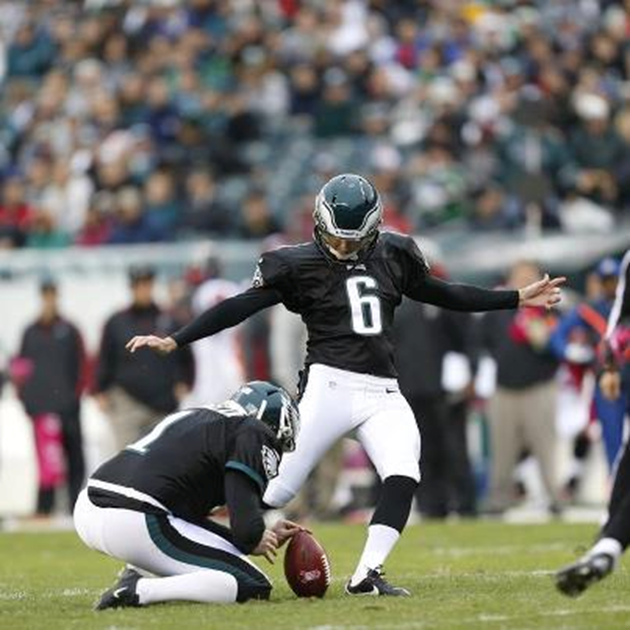 Alex Henery is the only kicker in NFL history with a minimum of 20 attempts to make 90 percent of his field goal attempts! Henery’s field goal Sunday against the Falcons made him 36-for-40 in his career, just ahead of current Cowboys kicker Dan Bailey for the all-time NFL field goal percentage lead. Bailey is 45-for-51 (88.2 percent). Neither one has enough attempts to qualify for the actual NFL record books. The legit NFL placekicking accuracy record holder is Nate Kaeding, who is 180-for-207 (87.0 percent) in his career with the Chargers. But based on a minimum of 40 kicks, your all-time leader is Henery. Henery might have some company soon, though. Vikings rookie kicker Blair Walsh has made 17 of 18 kicks (94.4 percent), and Ravens rookie Justin Tucker is 14-for-15 (93.3 percent). In fact, of the 10 most accurate kickers in history with a minimum of 10 attempts, nine are currently active (Mike Vanderjagt is the lone exception). Henery set an Eagles accuracy record last year (and an NFL rookie record) when he made 24 of 27 field goals (88.9 percent), and he’s ahead of that pace this year, with 12-for-13 (92.3 percent). If Henery makes at least 88 percent of his kicks this year, he’ll become the first kicker in NFL history to convert 88 percent or better (with a minimum of 16 attempts) in each of his first two seasons.